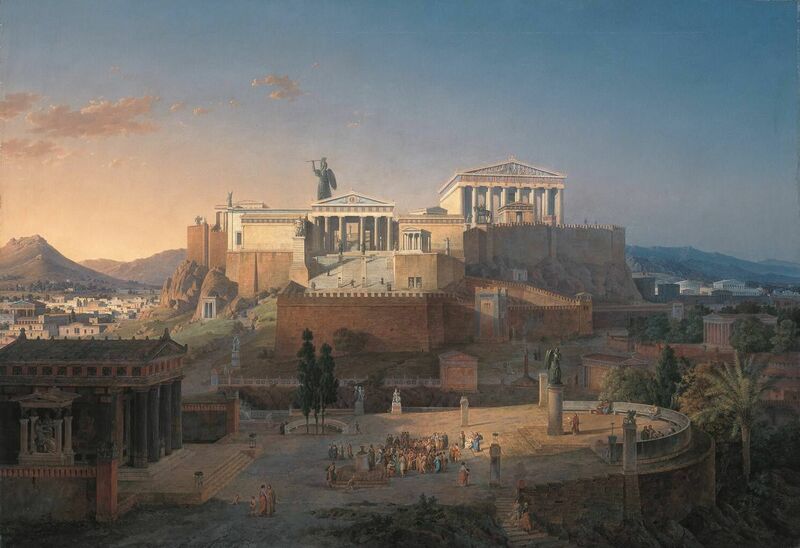 One thing I really hate is when someone blows up the Parthenon. Which they did on September 26, 1687. Now you might point the finger-bone of blame at the Venetians, whose artillery touched it off. But they in turn might note that marble doesn’t habitually explode unless some tasteless vandal is, say, storing gunpowder there. Which the Ottomans were. Yes, it’s our old friends the Turks. Having captured Athens in 1458 they promptly… what did they do? Right. They turned it into a mosque. Thanks for respecting the religious impulses of others even if you consider them mistaken. Then came the disaster of 1687, during the “Great Turkish War” from 1683-1699, the same one in which the Ottomans attacked Vienna for the last time, or so we hope. The Venetians were trying to recapture Athens, of all outrageous infidel provocations. And so the Turks fortified the Acropolis and filled it with gunpowder even though they’d already blown up the Propylaea or “entrance” to the Athenian Acropolis in 1656. As Oscar Wilde noted in a different context, one might be regarded as a misfortune. Two looks like carelessness. And indeed it speaks of carelessness, if not contempt, toward the achievements of other cultures and civilizations, the same inability to appreciate the beauty and nobility of human striving toward the divine even if misguided that led the Taliban to destroy ancient Buddhist statues in Afghanistan or the deliberate destruction of shrines in Iraq by ISIL and in Mali by various Islamist rebels. Beautiful as the Parthenon’s remains are today, we have sketches from the mid-17th century that show how much more had survived intact for over 1500 years until this catastrophe. And while one might also blame the Venetians for targeting the Parthenon, which the Ottomans may have thought they wouldn’t given its historic value and beauty, the decision to use it as a military asset is surely the main cause of the disaster. OK, so the Turks had an issue with defending Athens and it might have seemed a good place to store munitions. But it wasn’t given what happened. And anyway, sometimes there are things more important than keeping your illegitimate conquests. Or not, depending who you are. Lord Elgin takes a lot of heat for having collected a lot of what was left of the Parthenon and took it to the British Museum with the disputed permission of the Sultan. But at least he wanted to preserve and display it. It sure beats blowing it up, through malice, carelessness or a combination of the two.